In a medium size saucepan, combine the water, sugar, cinnamon and cloves. Bring to a boil while stirring constantly, then reduce heat and continue to simmer. Cut the orange in half and squeeze the juice into the pot. Place cloves into the orange peel and drop into the mixture. Cook until the mixture starts to thicken like syrup. Pour in the wine and rum (if using) and stir, heating gradually until steaming. DO NOT BOIL. Remove oranges and serve in prewarmed mugs. What type of red wines do you recommend? Rebekah, it is recommended to use a dry, robust, fruity red wine. It does not necessarily have to be expensive, but should be palatable on its own. One wine that would work is Gallo Merlot, or Cupcake Merlot might be a good choice as well. I just made a trial run and all I can say is yummy! Delish!!! I decided not to add the rum it doesn’t need any, this is so good. I can’t wait to share this with my best friend Petra. I’m glad you liked it! It is my favorite part of Winter! Can this be made a week ahead of time? If so, should I store it in the refrigerator ? Hi, Sheila! Yes, it can be made ahead of time. I bottle mine and do not refrigerate it. However, be aware that like any wine, it will degrade in quality if you leave it around for say, weeks (open, that is). If you use orange slices in it, I would wait until you heat it for serving. Always serve warm. Trust me. 😉 Enjoy! I just returned from 2 weeks in Germany, Austria and Hungary and enjoyed this all over! I want to make some for a Christmas party that I am hosting. I was thinking of having it in a crockpot on low. Do you think that would be ok? I also will need to make it ahead of time and transport it in gallon water jugs. Hello, Rose! How nice you recently went there! We will be heading to Berlin, Germany next Wednesday, and can not wait to have my first cup there! I have noticed that many street vendors selling Glühwein at the Christkindlmarkts tend to use crockpots, so that should be fine. If you have one with a warm feature, even better. You do not want to burn it, so you should try to keep the temperature low, even if it means a half hour on, a half hour off (with lid on to retain heat of course!). Transporting in the jugs is a great idea! I’m sure the party goers will love it! Happy holidays! 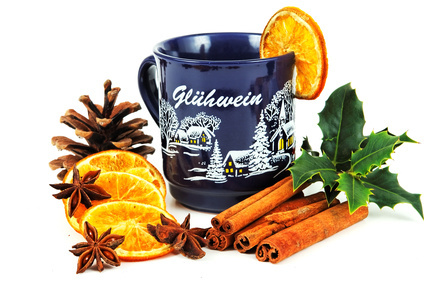 Just returned from our first trip to Europe, where we were mostly in Germany….Garmisch, Munich, Wiesbaden, Langenkreith etc…..went to the Christkindlmarkts in several places and imbibed lavishly and brought home all the mugs for proof!! Can’t wait to make my own…thanks! We’re stationed here in Germany and another good option instead of the rum is to use Amaretto. I’ve had this version at the Weinachtsmarkt in Rudesheim am Rhein and it is sooooooo good. I am attempting to make this as we speak but want to know do I take the pulp out of the oranges before putting them in the pot? There are actually two methods. The original recipe I added here requires squeezing the juice in, no need to remove pulp. Another option, slice the oranges, remove seeds and place the slices inside the pot. Some people like to push cloves into the slices before adding into the wine. Also, you may want to add extra sugar to adjust the sweetness. After simmering with fruit for about 15 minutes, try it for taste. I should write a revamped recipe soon. Enjoy! Thanks!!! I had removed the pulp because it seemed like it was going to come out in the mixture (some did anyway) but it tasted incredible!!! I think maybe I will try the orange slice way because I have pulp and cloves now in my wine and the slice way seems less messy but will it tastes as good? Thoughts??? I love your site and will be using it much more now after this turned out so great!! We tried the recipe today. It turned out great! The gluhwein was a nice reminder of Christmas in Augsburg. Thanks for the recipe. We used to play at the Eierschale nahe der Gedächtniskirche am Kurfürstendamm and would take breaks and run across the street to the Christmas market and buy cups and take back. so fun in the snow. of course things got a little loose by the 3rd set LOL. Merry Christmas. I’m unable to find my other recipe so I was very happy that this one comes very close. Thank you so much! The only part I see different is adding a 1/2 cup of the red wine to the sugar mixture instead of the water. So when I read your recipe, I knew it was the one for me. It really is the best when you make a sugar syrup first. We then add it to our 750ml bottled wein in the crock pot that we have on low for the day. We like, for our UN-sophisticated palate, Carlo Rossi Burgundy. We use a large tea ball type strainer to catch all the bits of delectable pulp and cloves and put them back in the hot wein. My husband is from Germany (born and raised) and really loves this recipe over all the others I’ve tried making and it comes the closest to the one in Nuremberg. We tried the bottled versions, but they just don’t have the taste we enjoyed when in Nuremberg Christmarkt. If you visit Nuremberg at Christmas time. Don’t stop at any of the small Wein booths as you meander through the markt, walk past the shops to the fork turn right. Go all the way back to the huge church on the right hand side it’s right before the church on the same side as the church. This one puts all the others to shame, plus you can watch the master Gluhwein makers as they pour the very hot rum over the sugar wafers into the wein. Then directly across from the church, there’s a restaurant (on your left side) that serves the best breakfast sausages but you can eat them anytime. Finger size and can order a dozen at a time. They make them fresh everyday. I believe it’s the Nuremberg Sausage Co. Anyway, this recipe comes the closest to being in Nuremberg… for us that is! Use Sangria as wine. It’s cheap, already sweetened and flavored with oranges. Once you prepared it put it into a closed thermos pump container. Serve in Coffee paper cups with lids. You don’t want this to spill in your house. It stains and sticks like hell to floors. Enjoy! You’ll love the smell in the house as much as the taste! What type of rum would you suggest? Nice recipe! I wouldn’t recommend tripling the amount of cloves as they can be very dominant in flavour, just leave the ten in for a little longer. Before adding them to the wine, heat them in a dry pan to make more flavour from the oils come out of them. Drank this on the ski slopes in Germany with a bowl of goulash soup and a brother or hard roll. Yumm.